I first heard of David Byrne and Fat Boy Slim’s Here Lies Love back in 2009 when I chanced upon it on iTunes. My eyes just drew on The Imelda Marcos album artwork and that was enough to tap my interest. 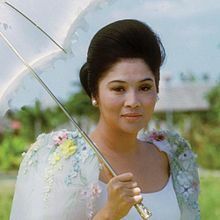 Now I’m not a Marcos supporter, in fact, I’m the opposite of that, but I still have a fascination with Imelda, just for being an icon. It’s like I’d buy their shirt but I wouldn’t buy it from them, if that makes sense at all. I had been listening to the album since then, so it was a pleasant surprise when I learned that the album was being conceptualized for the stage. Not being physically in New York, I could only read about it, from its developmental stage, to the updates, and to the good reviews of the show when it first opened off-Broadway. The cast recording was released a few weeks after the show was brought back last April, and for now, it’s the closest experience I have with the show. So far, I am loving it more than the conceptual album. The dance, showtune, and Kundiman mix rendered by leads Ruthie Ann Miles, Jose Llana, and Conrad Ricamora is enough for me for now to fill the void of not experiencing the show. I am especially enjoying the songs, Here Lies Love (the second one), Child of the Philippines, A Perfect Hand, Men Will Do Anything, and Why Don’t You Love Me but two tracks that are standing out for me right now are Don’t You Agree/ Pretty Face, the merged track that features Maria Christina Olivera’s very powerful and attention inducing vocals, and Fabulous One, which I am finding very trippy with the background synth reminiscent of the early 80’s. My only complaint with the album itself is the absence of one of my favourite song form the concept album, which is The Ladies in Blue. I’m not sure if it’s in the show and was only omitted in the cast recording, but I imagined it would have been great choreography if it was indeed in. 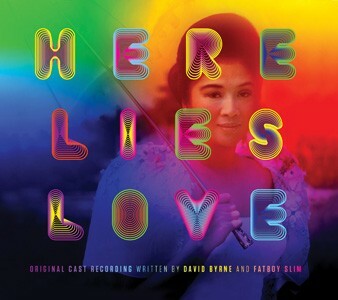 Overall, the cast recording of Here Lies Love is a wonderful album to play. It may not clearly tell the story of Imelda Marcos but it will showcase snippets while bringing you in a trance-y and dance-y state. And you will love the psychedelic version of the cover, too. Hopefully, by the time I get back to NYC, the show will still be running, and I am quite confident it will be there for quite some time, and hopefully I can still catch this cast!